Manual slow cookers used to be very popular many years ago but fell out of favor because you can’t control the cooking process that much. Slow cookers with timers, a keep warm function and maybe several heat settings are much better alternatives and the best programmable slow cooker can ensure that your dishes turn out great even if you’re not around for some hours. You can start a meal before you leave for work and come back to find it warm and ready to eat. Meats will be tender but not overcooked and stews will be bursting with flavor. When choosing from popular programmable slow cookers, make sure it has all the functionality you need and that it’s the right size for you and your family. Most programmable ones come in the 4 to 7 quart range and some are multi function cookers that you can also use for steaming or sautéing as well as slow cooking. If you’re looking to take it along with you to a potluck, make sure that the pot has a locking lid to prevent spills. The inner pot is usually stonewear or ceramic, but multi cookers can be non-stick aluminium or cast iron. The lid is usually glass. The outer casing can be plastic but stainless steel is better. A good cooker should be able to reach a simmer fairly quickly to prevent food sitting at unsafe temperatures. If a dish cooks for a long time, it shouldn’t let too much liquid evaporate or your food can get burnt. Here is our guide on how to buy an electric slow cooker. If you also like to do pressure cooking and you don’t have storage space for a separate appliance, consider buying an electric pressure cooker that also has a slow cooking feature. Otherwise, read on to see our top 5 slow cooker picks. The Hamilton Beach 33967A Set ‘n’ Forget is our pick for the best 6 quart slow cooker, as it has 3 settings for ease of cooking, namely manual, program and probe. It comes with an inbuilt temperature probe which ensures that meals that need temperature monitoring, like a pot roast or whole chicken, are cooked till just right. Set the temperature you want the meat to reach and the cooker will switch to the keep warm setting once the meat reaches it. You can see the current temperature on the probe during cooking. The Keep warm feature works on the programmable cooking mode as well. Being programmable means that you can leave your meal cooking at any time and come back later to find your food still warm and delicious, as it was cooked at the optimal temperature for the amount of time that you set. A digital timer makes it easy to determine the temperature set for cooking as well as the time remaining. It can be set for up to 12 hours in half hour increments. The traditional manual mode lets you only set temperature to high, medium or low without setting the time or letting it switch to warm when cooking is done. The lid is made of glass and if you need to travel with the cooker, it locks into place with a clip and seal gasket for safety and to prevent spillage. It comes with a clip-on spoon and handles for easy of carrying and serving, so it’s a great cooker to take to parties and pot lucks. The locking clamps should never be used during cooking; only after cooking is done and you need to transport the cooker. The parts can either be hand washed or put in the dishwasher. A few customers complain about the rubber gasket retaining the smell of what was cooked the last time. To avoid this, just rub some white vinegar along it. If you want a crock pot with locking lid, the SCCPVL610-S Programmable Cook and Carry is a good choice. Its lid is hinged and lockable and it has a gasket to prevent spillage. With cool touch handles, it is easy to carry and ideal for traveling to picnics. Its stoneware dish is easy to clean since it is dishwasher safe. It has a digital display countdown timer that can be set anywhere from 30 minutes to 20 hours after choosing the high or low setting. The auto warm feature keeps your meals warm for up to 6 hours after cooking, making it very convenient as you can cook and serve your food all from its crock. Having a capacity of 6-quarts, you can use it to prepare meals for a large gathering of 7 or more people. This is a no-frills oval shaped cooker without a lot of distracting features but with great performance and looks. Made of polished stainless steel with a stoneware crock whose capacity is 6.5 quarts, the Crock-Pot Programmable Touchscreen Slow Cooker comes with a touchscreen control panel that is not only easy to use but also intuitive. It has an auto-keep warm feature that ensures your meals stay warm for up to 6 hours, and being programmable, you can set the timer for between 30 minutes and 20 hours to cook on one of 3 heat settings. It comes with a light indicator to show when it is cooking and when it is on the keep warm and the timer counts down to when the food is done. The side handles are metal with silicone stay-cool wraps. The stoneware crock is not only dishwasher safe but can also be put in the oven or microwave and can be kept in the refrigerator too if there are leftovers. It has a glass lid that is also dishwasher safe. Some customers say that the cooker becomes quite hot and that the silicone wraps are not big so you have to be careful while gripping the handles. The rubber feet on the bottom can come off if you slide the cooker on a non-smooth surface. The Cuisinart Cook Central Multi-Cooker is available in 3 sizes – a 4 quart, a 6 quart and a 7 quart. The 4 and 6 qt models have the same features, while the 7 qt one has an extra roast feature. This multi-cooker is extremely versatile, allowing you to prepare meals as you see fit: you can choose to sauté, brown or slow cook your meals, and in the case of the 4-in-1 7 quart model, you can also roast and bake. It has easy to use preset function buttons (auto-keep warm, low, simmer and high) for increased convenience. A 24-hour timer makes it a breeze to cook virtually any type of meal using the programming feature. The advantage of a multi cooker as opposed to just a slow cooker is that you can use just this pot from start to finish. In fact, this unit made it on to our list of best multi-cookers. You can start browning your onions, meat etc. using the sauté/brown function for a few minutes at your selected time and then switch to slow cook at one of three temperature settings. You can set the timer for this part and once cooking is done, it automatically switches to a keep warm temperature until you’re ready to eat. It comes with a backlit LCD display that makes it easy to read the temperature settings and the timer. The included steam rack simplifies steaming of food, while the non-stick cooking pot makes it easy to sauté and brown your ingredients and also to warm food taken out of the fridge. You can program sauté temperatures in increments of 25 degrees up to 400 F. The 4-in-1 model also comes with a roasting rack that you can set a normal baking pan on to bake cakes or bread. Because the cooking pot is not ceramic, it is lighter and easier to handle and wash and there’s no risk of it cracking. It has a stainless steel housing that’s easy to wipe clean with a damp cloth. Since the inner pot is Teflon coated aluminium, you can’t put it into an oven, but if you get the 7 qt model, you can do all your baking and roasting in the cooker instead. Cuisinart has updated this model because there were a few complaints about the control panel but that isn’t a problem now and recent ratings are all 5 star. If you’re not a big family or not cooking for a party, a small cooker is easier to store and clean. 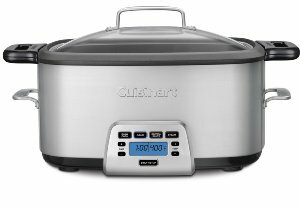 The Cuisinart 3.5 Quart Programmable Slow Cooker has all the necessary features that larger ones do, like a 24 hour programmable timer with Simmer, Low, and High settings and it will automatically shift to the Warm setting for up to 8 hours once cooking is done. You can switch the appliance on and off via a button but it will automatically switch off if the warm function reaches 8 hours. The crock insert is ceramic, the lid is glass with a chrome-plated knob, the handles are cool touch, the nonslip feet are in rubber and the casing is brushed stainless steel.